“That should be the spirit not a situation where someone is the minister of education in Nigeria and his children are schooling abroad. And by enforcing this too, we will be saving Nigeria a lot of foreign exchange being wasted on medical and academic tourism,” the governor said. 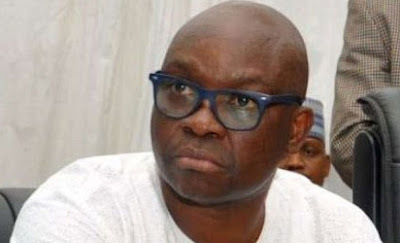 While condemning what he described as the hypocrisy of some Nigerian leaders, especially those in the All Progressives Congress (APC), Governor Fayose said; “Even children of President Muhammadu Buhari that they told us lived a modest life attended universities abroad. Shouldn’t President Buhari have lived by example by enrolling his children in universities in Nigeria?” While reiterating his commitment to the uplift of education in Ekiti State, Governor Fayose said; “We are after quality education and we want to maintain our position as leaders in the education sector. We are first in NECO examinations and we are among the best in WAEC and the only industry in Ekiti State is education and we can’t afford to let it depreciate.” The governor also called on parents, corporate bodies and others to support the government in the task of improving the standard of education in the state.